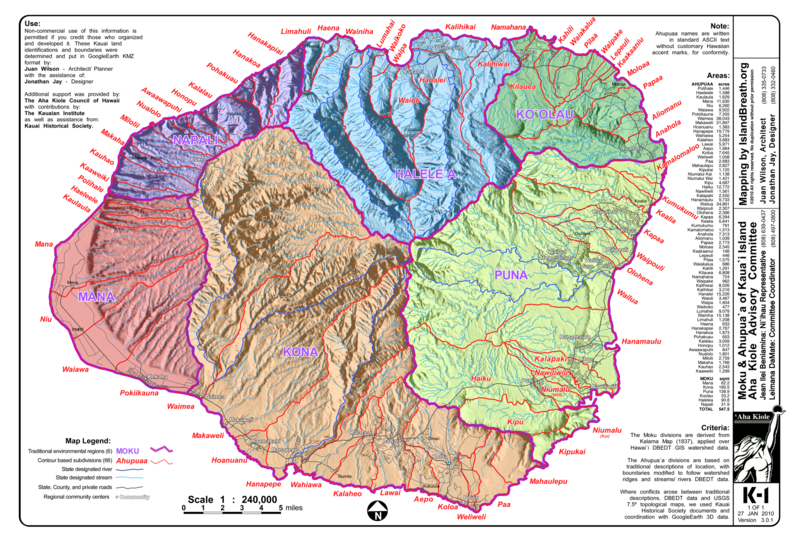 SUBHEAD: Work continues on mapping land management areas on Kauai using watersheds and traditional ahupuaa and moku boundaries. [IB Editor's Note: The maps and GoogleEarth model in this article has been updated on 29 January 2010. For latest maps for all Hawaiian islands see (http://www.islandbreath.org/hawaiinei/hawaiinei.html) and (http://www.islandbreath.org/mokupuni/mokupuni.html) 8/26/16. Image above: Kauai Moku-Ahupuaa Map Revision K-1 1/27/10. Click on it to enlarge. © 2010 by IslandBreath.org. All rights reserved. It has been my position for the last twenty years that bio-regionalism is the foundation of sustainability. The Hawaiians were many centuries ahead of the Transition Town, Permaculture and Community Garden movements we see today. Their land management techniques spanned a millennium and could still be used today to balance our load on the island. In early 2007 we (Jonathan Jay and I) began work on determining what might be areas of Kauai that could become manageable township areas to better govern the island. We looked at the traditional Hawaiian moku (regional divisions) as a guide. This work was combined with a presentation at the November 2007 LEGS Sustainability conference in Lihue. That presentation included a sustainability Land Use Plan that split exisitn Agricultural land use designation in two. The makai half to become Rural land and the mauka half to become a new catagory Forest. Forest would be similar to Conservation, but allow replacement level harvesting of grew in the zone. It would be similar in some ways to Rural land but not allow for housing or permanent settlement. Early in 2008 we became aware of the formation of the Aha Kiole Council. This group of Hawaiian people was tasked with bringing the host culture's knowledge of Hawaiian land management to the State of Hawaii. Our efforts in behalf of the Aha Kiole Council was to work with them to develop a map of traditional moku and ahupuaa (roughly watersheds). A preliminary map was produced and distributed in December of 2008 that was based on information gathered through the year. This map was adopted by the Aha Kiole Council as the ahupuaa and moku divisions of Kauai and was published as part of the council's submission of regional management areas. The map produced at that time had the boundaries of four ahupuaa still unresolved. Over the last year these boundaries have been identified and all areas have been refined. The tool for upgrading the area boundaries was the use GoogleEarth with 3D topography and aerial orthophotography. We have recently published a link to our GoogleEarth efforts on this website and have updated it as work progressed. This article provides a "paper" map version of our latest Hawaiian traditional boundaries of Kauai. The format is set for a convenient letter size printout (8.5" x 11"). A PNG and PDF version are available. Island Breath: Kauai Aina K-1 Revision 3.0.1 (17.0 mb .PDF) Click on the link below to gret the the ZIP file for loading Kauai ahupuaa into GoogleEarth: (100127KauaiAinaLink.zip). This map and the GoogleEarth map will continued to be adjusted as the work goes on. Non-commercial use of this information is permitted if you credit those who organized and developed it. Credits for Moku and Ahupuaa of the island of Kauai on GoogleEarth. The Moku divisions are derived from Kalama Map (1837), applied over Hawai`i DBEDT GIS watershed data. The Ahupua`a divisions are based on traditional descriptions of location, with boundaries modified to follow watershed ridges and streams/rivers from DBEDT data. Where conflicts arose between traditional descriptions, DBEDT data and USGS 7.5º topological maps, we used Kauai Historical Society documents and coordination with GoogleEarth imaging and 3D countouring data. Area names are written in standard ASCII text without traditional Hawaiian accent marks. Area measurements and perimeter lengths are only approximations and will be updated. Users are responsible themselves for verifying the information in this file. Streams and rivers shown are from HI DBEDT GIS database online. just wanted to say "great work on the published ahupuaa maps"! i was actually looking for older, historical maps when i ran across your site. great info to be found here!